Are you on the lookout of a trusted Quakers hill dentist? Then look no further than Design Dental in Quakers Hill. We understanding the anxiety that comes with visiting a dentist, that is why we offer a relaxed and caring atmosphere with personalised care and friendly staff who are always willing to help. All our dentist are fully certified and our dental assistants are licensed professionals, these are some of the reasons why Design Dental should be your choice of dentist. As one of the most trusted Quakers hill dentist clinic, we can help you with all major dentistry solutions- whether you would need general dentistry or cosmetic dentistry, preventive dentistry and so on. At Design Dentist we have an on-site laboratory, this way we serve you faster with all the permanent or temporary restorations. We are a reliable dental clinic that is equipped with advanced dental treatment tools and techniques. Our dental clinic makes sure to provide the patients with utmost comfortable and stress-free dental treatment with painless treatment procedures- including sleep dentistry. Our trusted dental clinic generally extend custom dental treatments to make sure the individual needs of the patient at their best. Root canal treatment is not a painful procedure! The treatment itself is done by administering anaesthesia. In fact, the procedure is done to help you relieve or avoid pain related to a decaying or a fractured tooth. After the procedure, you will be given antibiotics and painkillers to recover soon. 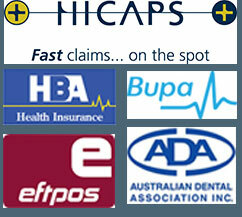 For further details, contact our dentist Quakers Hill @ (02) 8798 0882. Wisdom tooth extraction is one of the most standard procedures, and it can take up 2weeks to recover completely after extracting a wisdom tooth. However, you should look after the wound properly so that you can heal as early as possible. After extracting a wisdom tooth, our Quakers hill dentist will provide post-operative care instruction which you must follow to recover soon. If your tooth is knocked out, pick up the tooth by the crown not the root part and visit the nearest dental clinic within 30 minutes. If a tooth is knocked out, there are more chances it will survive if it is put back into the gums quickly. Every minute the tooth is out of the gum, the chances of surviving are less. Our Quakers hill dental clinic is open 24/7 for emergency appointments, and you can reach us @ (02) 8798 0882. Dental implants can last a long time. Recent studies show a success rate of greater than 95% than other teeth replacement options. However, you should maintain your implants by practicing good oral hygiene habits and visiting the Quakers hill dentist twice a year for dental check-ups and professional cleanings. To find out dental implants are a good solution for you, call us @ (02) 8798 0882 or schedule an appointment with our dentist. Dental crowns are a popular solution for damaged or unsightly teeth. It is a tooth-shaped cap that is placed on the problematic tooth to restore the functionality, shape, size, strength, and improve the appearance of a damaged tooth. Crowns are cemented onto existing teeth by a dentist Quakers hill or prosthodontist. It is recommended to protect a week tooth from fracturing, restore a fractured or decayed tooth, attach a bridge and cover a poorly shaped tooth. For g details about the price of crowns, call us @ (02) 8798 0882 or visit our clinic.